Horseradish Thongs delivered direct by D.T.Brown seeds. 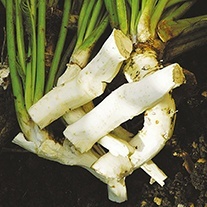 Horseradish thongs (roots) grow best in deep, well-drained soil which has had plenty of well-rotted farmyard manure (such as Orgro) or garden compost added to it. Plant the thongs as soon as possible after receipt. Plant the thongs at a slight angle with the sloping cut at the base and the flat one at the top, at about 5cm (2in) below the soils surface. Allow 60cm (2in) between thongs.